You all knew this was coming. There is no way Subaru, who could replace their sales staff with monkeys in polo shirts and still hit records every month would sit idly by while VW launches the Atlas. This is the Subaru Ascent because sometimes an Outback isn’t big enough. Subaru is considered a scrappy little automaker that still sells more Foresters and Outbacks than it did the year before. You have to hand it to Subaru, it is really good at making crossovers that work for pretty much everyone. Except for those people who need to tote around a small clan and require three-rows of seats. 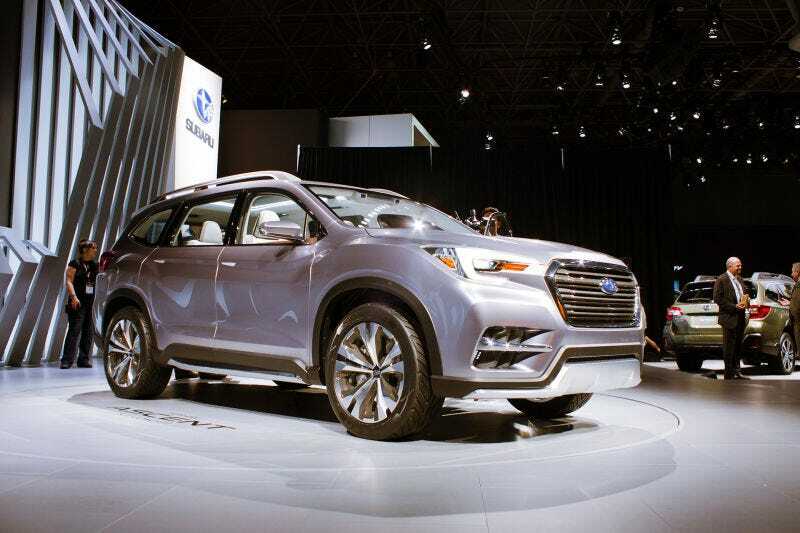 Now, this isn’t Subaru’s first adventure into the three-row crossover game, but the company would rather not talk about the ill-fated Tribeca. The technical details are sparse at the moment as the Ascent is still technically just a “concept” but unlike the wild Visiv-7 that we saw in LA, the Ascent looks very much production ready. What we do know is that it will be powered by an all-new direct injection, turbocharged boxer motor, come standard with Subaru’s legendary all-wheel-drive system, and with a wheelbase of 117 inches, it is incredibly close in size to Volkswagen’s all new Atlas. Subaru says the production car should hit dealerships sometime in 2018.